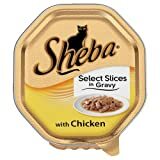 SHEBA® has never been a brand for just anybody. Rather a distinguished brand for only those who have a strong inner connection with their cats. What appears to many as an exaggeration, or even a form of decadence, is simply the fulfilment of a desire of the heart: finally there’s a cat food with which one can indulge their beloved on a daily basis. This entry was posted in Uncategorized and tagged Adult, Chicken, Food, Gravy, Select, Sheba, Slices, Tray by One Boutique. Bookmark the permalink.